« Vermont 2018 – Wednesday at Bread and Puppets! Vermont 2018 – Thursday at Craftsbury Common! Another morning and another demonstration in the Ski Hut Studio. 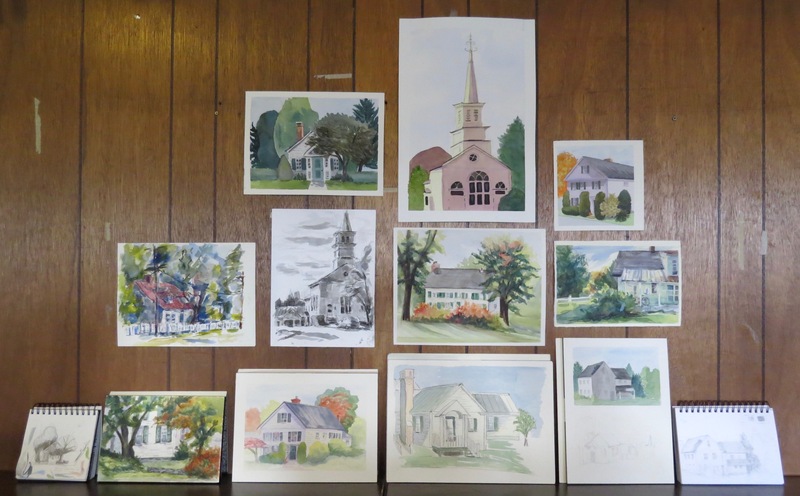 The weather was fine and our plan was to paint at Craftsbury Common, which features a lot of charming white buildings. Well, we didn’t have any white paint so what would we do? The white of the paper can be used, of course, but sometimes it needs a little help. I discussed ways to very lightly tint the paper to create warm, cool or neutral whites. Also, we looked at how to mix whites in shadow. White can also be enhanced by context. For example, a black roof and shutters can help make a wall in shadow look whiter. I wrapped up the demonstration and off we went to Craftsbury Common for a very pleasant day of sketching and painting. We had a few unexpected art critics from nearby Sterling College. It was a relief to enjoy such good weather. Still, critiques are best held indoors so, at the end of the day, we convened at our Ski Hut Studio. I was very pleased to see the progress made over the week to date. There’s one more day to go. Stay tuned! This entry was posted on 09/10/2018 at 10:12 am and is filed under Art Workshops, Barry's Demonstrations, Sketching, USA, Vermont. You can follow any responses to this entry through the RSS 2.0 feed. You can leave a response, or trackback from your own site. I live nearby. Where was this workshop advertised?